China plans to invite diplomats from European countries to Northwest China's Xinjiang Uyghur Autonomous Region to enhance their understanding of the region and strengthen mutual cooperation, China's Foreign Ministry said on Thursday. "I believe that through this visit, European diplomats will see with their own eyes Xinjiang's stability and harmony as well as local residents' happy life," Foreign Ministry spokesperson Geng Shuang said at a press briefing on Thursday. The specific time and arrangements for the visit are still being worked out, Geng said. Reuters reported on Wednesday that China will invite Beijing-based European diplomats to Xinjiang, saying that this would be the first time by a large group of Western diplomats to the region. Many foreign diplomats and media have been invited to Xinjiang and they were impressed by the achievements of the region's de-extremism. 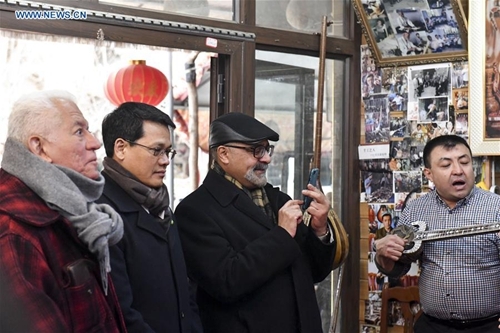 Senior diplomats from seven countries and an international organization visited Xinjiang Uyghur Autonomous Region from February 28 to March 2 at the invitation of the regional government. During the trip, diplomats from Myanmar, Algeria, Morocco, Vietnam, Hungary, Greece, Singapore and the mission of the League of Arab States in China, visited various places across the region. They said that they were impressed by Xinjiang's openness, inclusiveness and ethnic unity, as well as its achievements in improving people's livelihood, the Xinhua News Agency reported. Diplomats from 12 countries, including Thailand, India and Pakistan, were invited to Xinjiang in late 2018. In February 2019, a media group from Indonesia and Malaysia have visited Xinjiang to find out about China's policies on eradicating extremism.